Setup and trigger live Voice Call Notifications to those who need to know with Ubidots Events Engine. Sometimes Emergencies require a true voice phone call because the SMS or Email simply takes too long to acknowledge. Send Voice Calls notifications with Ubidots in just a few simple steps. Configure the Event "If trigger"
Configure the Voice Call "Action"
To begin, create a new event from the "Events" section of the "Data" tab in your Ubidots Navbar. 2. Configure the Event "If Trigger"
Next, configure the Event logic using the intuitive user interface. For additional details to how you can configure conditional and complex Event triggers, check out the Creating Conditional Events and Alerts User Guide. IMPORTANT NOTE: See below for the expectations for when an Ubidots Event will be triggered. Additional trigger details and situations can be found in the Events User Guide. 3. Configure the Voice Call "Action"
With the "If trigger" event logic compiled, it is now time to create the action and in this case a Voice Call notification. Step 6: Assign the correct notification text to be delivered to the receiving phone number(s). 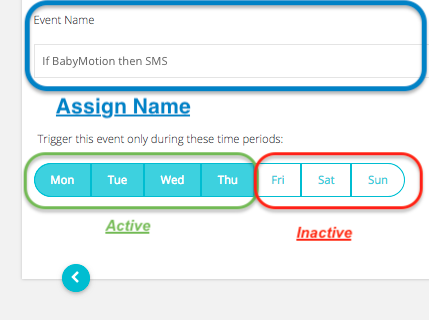 Step 8: Assign Event Name and Activity window (see below). Now it is your turn to build your very own Voice Call notification to keep those who need to know in the knows, when they need to know. If you need a little help along the way, no problem, just message our team via email at support@ubidots.com or by the in-app chat channel in the bottom right of your Admin App Builder, and we'll step up to assist further. Voice calling notifications from Ubidots are billing is based on this pricing schedule. Each call is billed based on the country and the destination prefix of the dialed phone-number. Voice call events do not typically last longer than 1 minute.